The Wolfgang Polishin' Pal makes polishing your paint to a high-gloss finish easy! 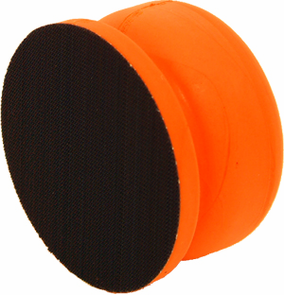 This comfortable 4-inch pad mount reduces the inconsistency commonly associated with hand-wax application. Now you can apply a uniform coat of Wolfgang Deep Gloss 3.0 Paint Sealant or Wolfgang Fuzion Carnauba Polymer Estate Wax for breath-taking results. Reduce the effort of hand polishing and improve your results with the Wolfgang Polishin' Pal. Wolfgang Concours Car Care Products are famous for the award-winning shine they create. The Wolfgang Polishin' Pal makes achieving the renowned Wolfgang shine by hand effortless. Enthusiasts know that secret to a concours-quality shine is polishing the paint to a mirror-smooth finish, free of swirl marks and scratches. The Wolfgang Polishin' Pal eliminates the draw backs of traditional hand polishing, including fatigue and uneven pressure. Polishing paint by hand is terribly inefficient. Holding a thin microfiber towel under your fingers and rubbing back and forth will create uneven spots and cause your hands to cramp. The Wolfgang Polishin' Pal allows you to mount the same high-quality foam polishing pads used by machine polishers in addition to applying consistent pressure for high-quality results. Achieve the famous Wolfgang Concours shine with help from a friend dedicated to doing the task correctly – The Wolfgang Polishin' Pal.